angry chicken: quilt monday-small quilt cards! "the long walk home." and "I keep my stuff in there." 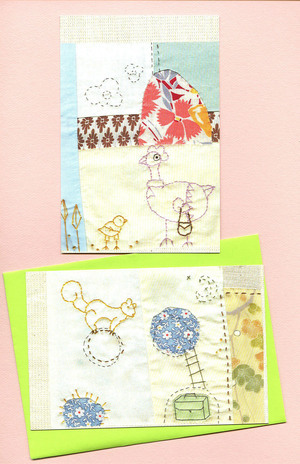 are featured in this pack (these notecards are details from the small quilts here) 10 postcards and 10 bright green envelopes (how festive!) all tucked into a clear resealable baggie. They would make the perfect stocking stuffer or gift for that special sewing someone in your life, don't you think? I sure do. Like the other card pack, they are $10 plus $2 shipping and they will be up on king pod later this week (I am trying to give pete a break, here.) but you can buy them right now by clicking this handy-dandy paypal button:. **please e-mail me if you are overseas and I will send you an invoice. thanks!